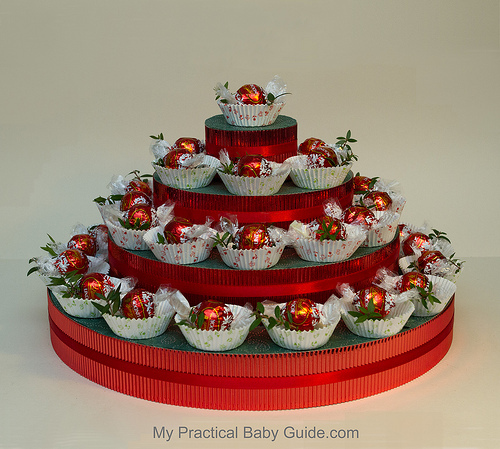 Here is a DIY Christmas centerpiece made of corrugated paper and decorated with candies. The base is similar to our Christmas Wreath centerpiece. If you like to make it please see our tutorials for items similar to this one. 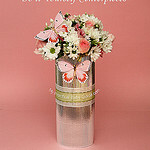 This centerpiece is very easy to make and although inexpensive it is very impressive. Of course this is just another suggestion, you can use this base for many occasions, all you have to do is to change the color scheme and objects. Petit fours can look magnificent as well as flowers, or any ornaments of your choice that suit the occasion. If you like to make this piece and you have questions, please don’t hesitate to contact us, we’ll be more than glad to assist you. Here is a table centerpiece for Christmas and the Holiday Season made out of corrugated paper. It is decorated with fresh branches, dried flowers, ribbons and glass birds. 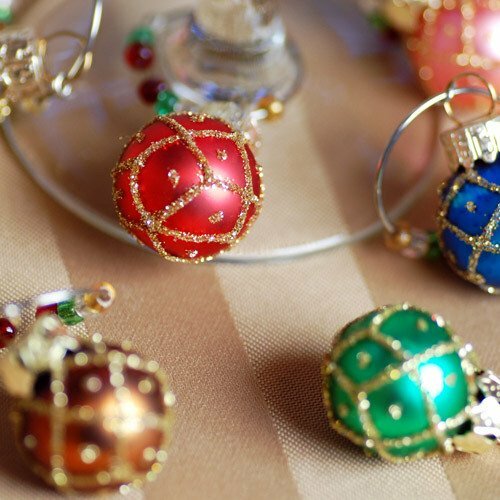 The idea was to create 5 Christmas wreaths of various sizes and to arrange them on top of the five circular bases. However, in order to make it more simple for the unexperienced who are not familiar with the art of flower arrangements, we chose an easy way that makes the piece just as nice. The leaves were taken from bushes that grow in our garden. We cut off the small branches from the main stem and arrange them neatly around the bases. On top, we added some small dried flowers, acorns and little balls made out of red Fimo. You can use tiny flowers or whole branches with tiny blossoms like the kinds used to add volume to flower arrangements. These come in many colors and shades and will be just perfect for this purpose. We have used our antique glass birds but any Christmas ornaments of your choice will be just as nice. The construction of the centerpiece is very simple. 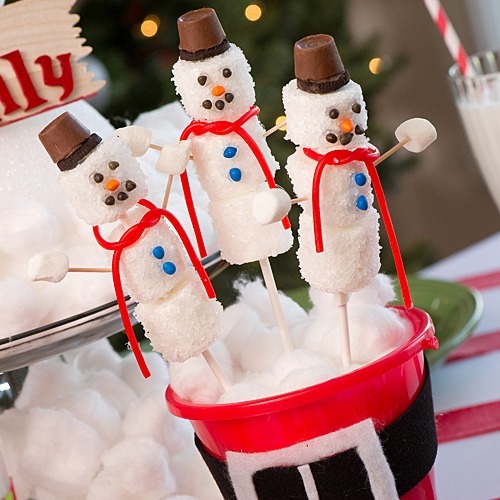 To get an idea how to make it, please see some of our tutorials for items similar to this one. If you choose to make this piece and you have questions, don’t hesitate to contact us, we’ll be glad to help you. 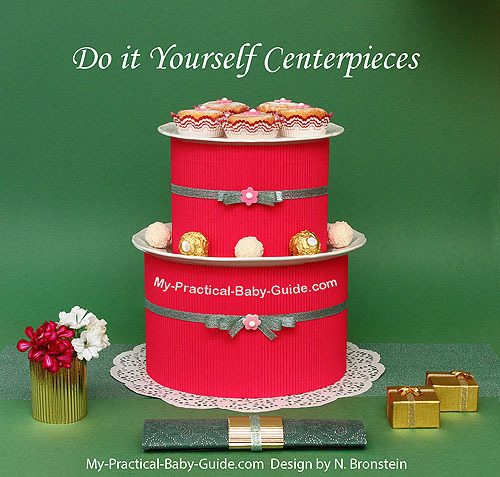 A centerpiece that is suitable for a baby shower celebrated during the holiday season. Traditional Christmas colors of red green and gold. Economical, easy and quick to build and assemble. Materials used : cream plates, a magenta/red matt wavy/corrugated paper, a metallic gold wavy/corrugated paper, a lace paper cake circle, white and red paper cupcake holders, cupcakes, candies, glitter soft green ribbon, sugar flowers. The ground suggested is green, this is either for a tablecloth or for a runner that can be placed on a cream tablecloth. For the runner you can use a green Canson paper as in the picture and you can add more texture with a sparkle gold and green paper for luxurious look. You can also use Dupioni or any other silk instead of paper. Our suggestion for the table setting: If you use a cream tablecloth you can use light green plates with light green napkins or white plates with subtle red decorations and red napkins. If your tablecloth is light green, white plates and white napkins will look great. You can enhance the look of the setting and harmonize it with the centerpiece by adding little bowls covered with the metallic gold wavy/corrugated paper. You can use the bowls to serve salads, sweets or anything that goes with your menu. 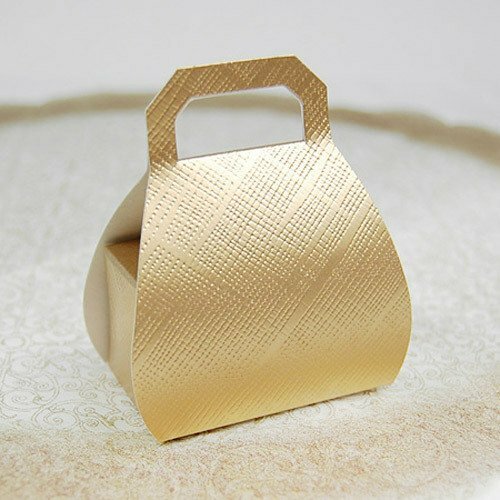 You can also cut narrow strips from the wavy/ corrugated gold paper and create rings to hold the napkins. You can also add decoration of red and white flowers to the table. Arrange the flowers in plain small glasses covered with a gold metallic paper as seen in the picture. This presentation of several small bowls of flowers around the table, will look fantastic. 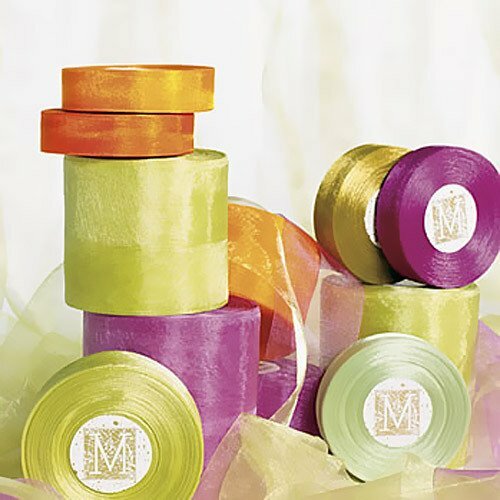 For the favor box in the front use any green and gold/silver paper and metallic gold wavy/corrugated paper and tie with the green ribbon. For a tutorial on how to make this centerpiece please follow this link. 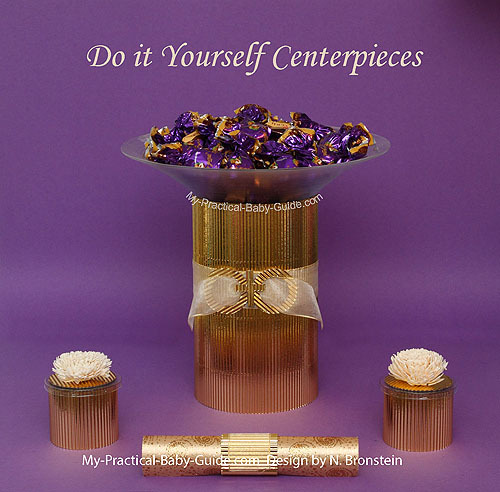 (The step by step photographs are of the Boy Baby Shower Centerpiece in blue; however, the basic design is identical). 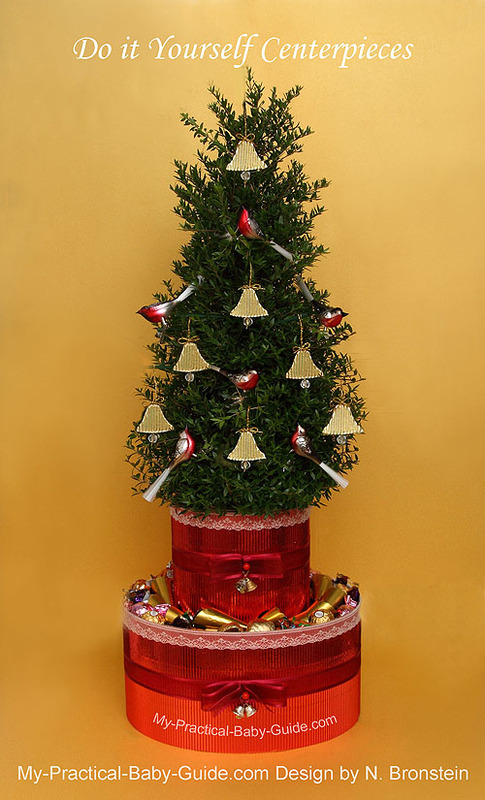 This is a suggestion for a wishing tree with candies in red green and gold, decorated with glass Robins and bell shaped wishing cards, suitable for a baby shower celebrated during the holiday season. You can adapt this design for other decoration purposes in the season. The centerpiece is very simple to make. The materials used: A 20" high Myrtus plant in a pot trimmed like a traditional Christmas tree, 7 crystal beads, 6 glass robins, red and gold metallic wavy paper, a strip of lace, a translucent dark red silk ribbon, two pairs of tiny bells and assorted candies in gold with touches of green cream and brown. This centerpiece is more impressive in reality than in the photo. 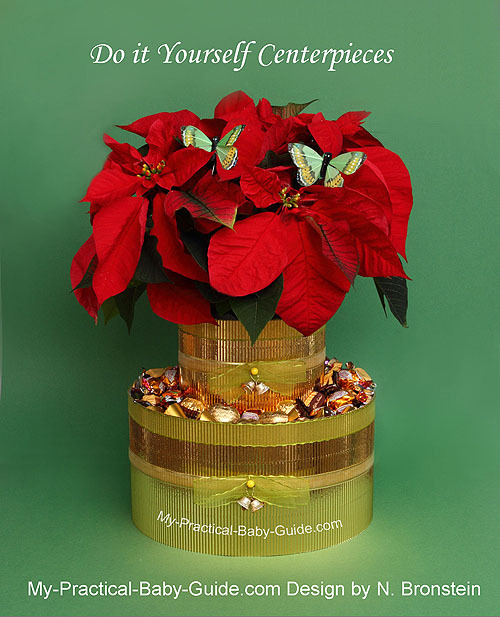 This centerpiece/decoration of Poinsettias Plant and Candies is suitable for all occasions celebrated during the holiday season. We have chosen the lovely ﻿Poinsettias﻿ plant which has tiny yellow flowers surrounded by red and green leaves. This plant is associated with Christmas and is one of its symbols.The colors of the piece are the traditional green red and gold. This piece is very easy to make. This centerpiece is as impressive in reality as in the photo. 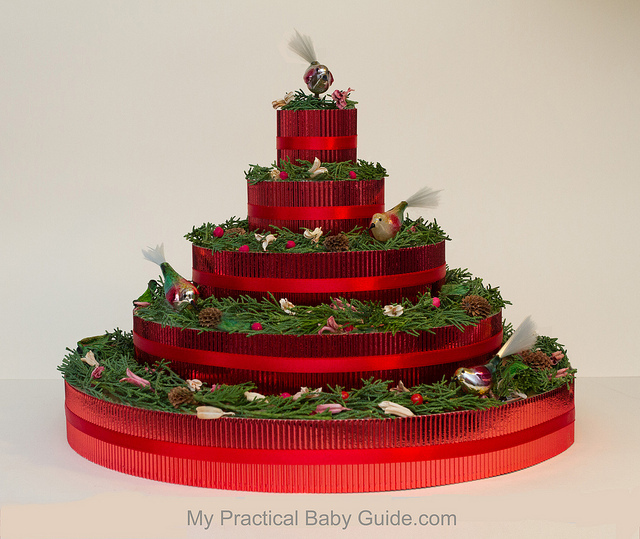 (The step by step photographs are of the Christmas Wishing Tree Centerpiece; however, the basic design is identical).